After a long break with limited amount of time updating my blog, I have finally decided to start it up again. No promises this time, just trying to slowly get back in the „groove“ as they say. 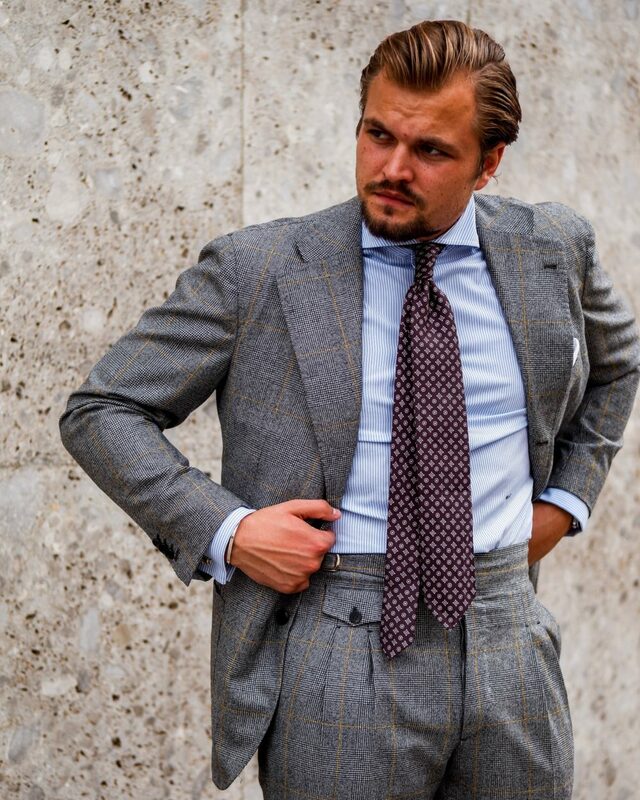 Lets get back into the Outfit section on TDC and check out a long overdue post about this suit by Massura and Orazio Luciano. My made to measure experience has expanded in the last few years. Having worked in the same field for a while, I am getting closer to my preferred fit. Another preference of mine is the endless options you have. I strongly believe that more people would go for tailor made products if they knew what emended options they have. Yes! It costs money, and yes, most of these items have no real value afterwards (taking a watch for instance). The big „but“, however is, the fact that it will fit only YOU. This is what made my experience even more exciting. I am getting a suit, specifically made for ME. Lets check out what I chose. Take a look at this amazing fabric. 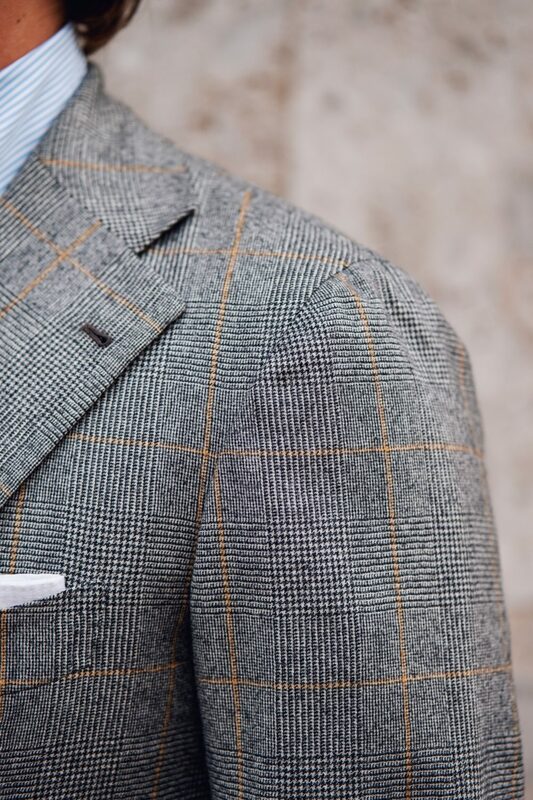 It is made by Vitale Barberis Canonico. Established in 1663, VBC today is one of the leading if not the most recognizable fabric producer in the world. Now in the 14th generation of the family, the company produces, in my opinion, the most versatile fabrics for suits, jackets and trousers. We will talk about them more in a another post. Now you have an idea where the fabric is from. It is made out of flannel, making it the perfect item for the colder months. Keeping you nice and warm and feels soooo soft. There are many things made out of flannel these days as it is soft and durable. Products such as bed lining, pillow casing, socks, and cup holders (im sure of this one). Now, the suit, has a nice Prince of Wales pattern with a yellow over check. 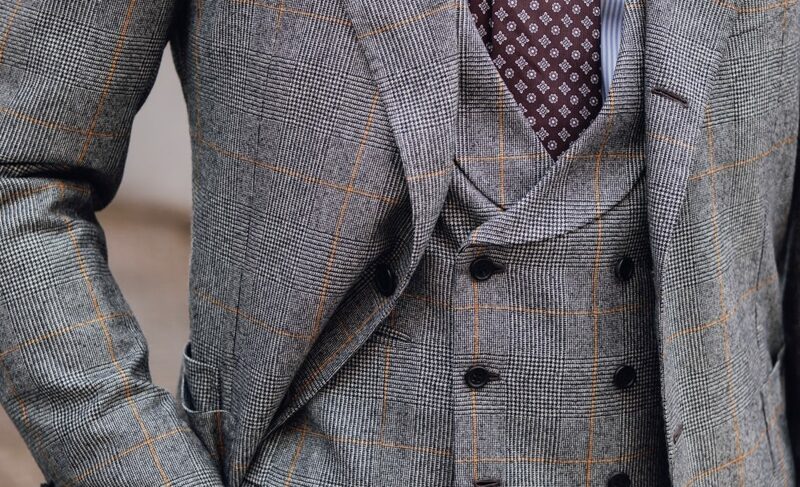 The structure is subtle, yet, when you come closer you really see the playfulness of the suit. I always prefer a bit of pattern as it allows you to ben the rules a little bit and lets you stand out from a rather dull blue and grey business crowd. Let me elaborate on this particular style of suit. It is a three piece suit featuring a double breasted vest and higher waistband with one overlapping belt/adjuster. I guess you could say this is a Gurkha trouser (if you want to read my review of Gurkha trouser, click here). 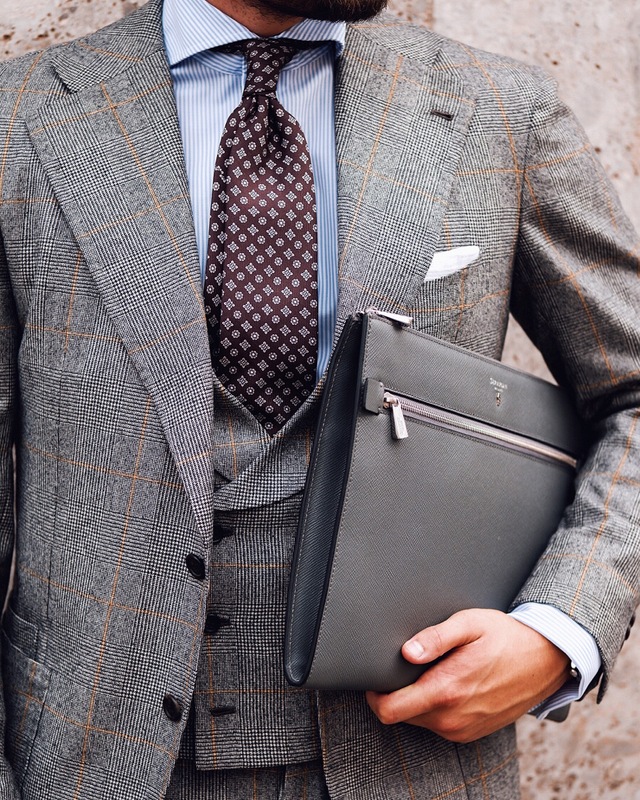 What I particularly like about this suit, is the wide lapel. As I have rather wide straight shoulders, it compliments my silouhette when I have a more balanced lapel shape. Also, if you like closely, you can see a ticket pocket on the right side on the patch pocket. This is rather iconic to the house of Orazio Luciano and makes the suit even more extravagant than it already is. Don’t get me wrong! I really like extravagant and different, however, looking back at the results of this suit, I would change a few things. Take the length of the jacket for example. It is too short in comparison to the rest of the suit. Over the last few months and having analyzed my fit and preference, I have wanted to lengthen my jackets a bit. Not too long, but just a tad in order to make it more equal to the rest. Another thing I would change having worn this suit a couple of times. The style of trouser should stay classic with normal side adjusters, double pleats and a 3.5-4cm wide waistband. Not too extravagant as with time, fashion fades and style lasts. Overall, I am very happy with this suit by Massura. I will wear it a lot in the colder season and also as separates which, I have done a couple of times if you head over to my Instagram account. I believe in purchasing items that have multiple purposes. 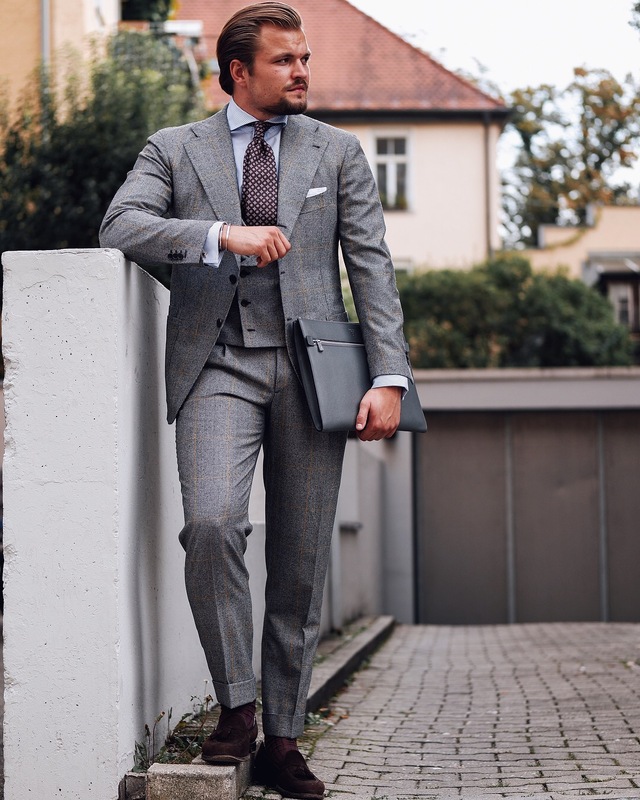 If the item comes in a crazy pattern, it is often times even recommended only wearing it as seperates, but in this case, the suit is subtle enough to wear all together as well. Lets call it a win – win situation. What do you think of this look? Topping it off with right details makes it stand out more. Thank you to Moritz for his amazing skills and his eye for details. 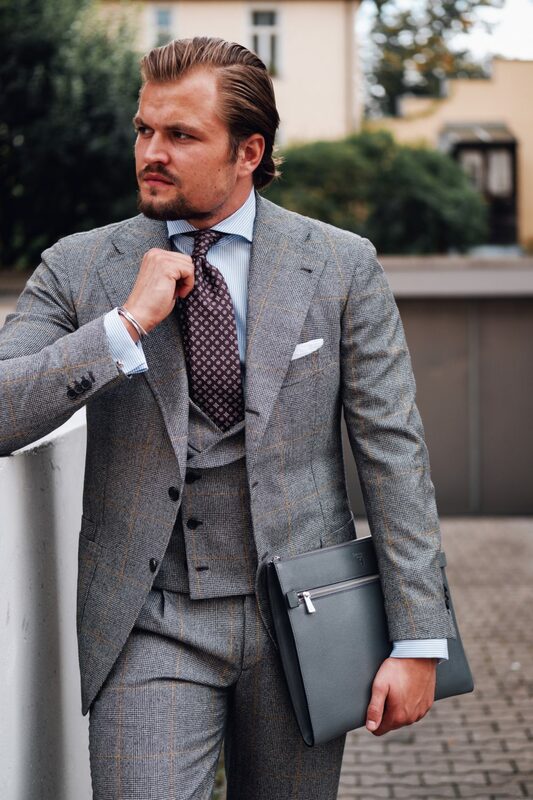 The suit would have not come out this good without him taking another look. To book an appointment with Massura, feel free to E-mail me or Massura directly.